I have watched some depressing anime in the past, but none have been quite on the level of the bottomless pit of despair that is M3: The Dark Metal. M3 is the story a group of a people living on the border of the Dark Realm—a bubble of blackness that turns those who enter the ruined city into metallic husks while their strong emotions manifest as monsters. In the hope of exploring—and ultimately destroying—the Dark Realm, eight young adults with a strong resistance to the Dark Realm's effects are brought together and are put into a mecha piloting program. But make no mistake, M3 is not really an anime about young people in giant robots fighting monsters. Rather, M3 is an emotional thriller more concerned with the mindset of its characters and the effects of plot revelations on those characters than on hitting the typical mecha tropes. The mecha anime setting is really just the backdrop—the catalyst for character development in the anime. There are eight main characters in M3—with an additional four characters having large supporting roles. This is a large cast for an anime and thus characters and their stories could easily be lost in the sea of faces. However, M3 does an excellent job of making each character unique in both visual design and personality. Moreover, by the third episode, the main cast is split up into pairs, making them even easier to remember and distinguish. While largely an ensemble show, there is no doubt that Akashi—an orphaned high schooler whose brother died on a mission inside the Dark Realm—is the show’s main character. If you are even a passing anime fan, you have seen his type before. He is quiet, brooding, standoffish, and enveloped in his own angst. However, unlike most series—where such a personality is romanticized—M3 plays it straight. His personality is directly responsible for the majority of his problems in the series. When someone seeks Akashi's help or support—mistakenly seeing him as someone who is emotionally in control—he rudely rebuffs them. Thus, with no one to turn to, they emotionally self-destruct. Over the course of the show, he realizes the effect his personality has on others and so tries to change. However, what he doesn't realize is that he is being just as self-centered as before; instead of trying to understand and sympathize with the pain of others, he simply doesn't want to feel guilt for being the cause of their pain. So when things go bad—as they inevitably do—he emotionally collapses into self-angst, blaming others instead of recognizing his own faults. While far from uplifting, it is a compelling emotional study in its own way. There is a common trope in mecha anime: a completely untrained and inexperienced young person stumbles into a prototype giant robot and somehow becomes the only person capable of piloting it. It is done so often that it seems like the audience is supposed to simply accept this setup as a necessary evil to get the story going. M3, on the other hand, builds an entire plot around it. The central mystery for the first half of M3 revolves around what exactly the new protoype giant robots are and why only certain people can pilot them. Once this mystery is revealed, the subsequent episodes then focus on the emotional fallout that such a revelation causes. And frankly, taken as a whole, the dark secret of the giant robots is pretty fucked up. Really, when it all comes down to it, M3 is just a never-ending chain of messed-up moments specifically designed to torment you emotionally. Every episode has at least one unsettling moment or heartbreaking scene—and most have far more than one. Moreover, the series seems only to escalate in the amount and intensity of the despair it projects. There are no happy moments in M3—no rest from the sea of depression it embodies. Some will no doubt find this compelling as they root for their favorite characters, all the while knowing that the next disaster is just over the horizon. Others will likely find the series too depressing to deal with—which, let me tell you, is perfectly understandable. Watching M3 is emotional masochism, pure and simple. There were simply mornings when I awoke, queued up M3 on my PVR... and then decided to watch something completely different because I didn't really feel like being depressed all day. But that said, I greatly enjoyed (if such a word can be applied in this case) the first half of M3 and am excited to see where it will go from here. The characters are excellently designed and brilliantly written, and it has a captivating plot that manhandles your emotions into submission instead of simply playing with them. 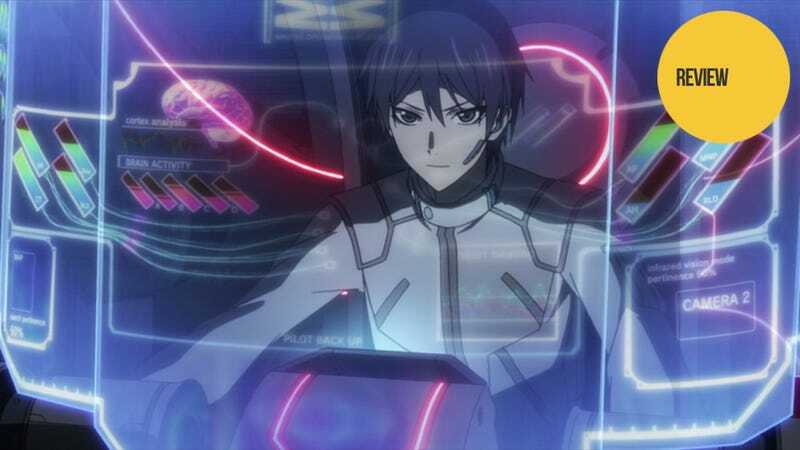 If the idea of a psychological mecha anime sounds even a little bit interesting, give M3: The Dark Metal a try. M3: The Dark Metal is airing on Tokyo MX in Japan. It is currently available in the US for free and with English subtitles on Daisuki.